Performance tests have not been previously been made on a Mustang II. The climb and level speed performance at combat rating has been measured on the aircraft as received with the F/20R engine. Subsequently the supercharger gear ratio was changed to convert the engine to the F.4R and the tests repeated. W/T mast and aerial to fin. 12" red aerial under starboard wing. 2 - .5" guns in each wing with doped patches over gun muzzle ports and ejection chutes. Radiator outlet duct opening variable but no adjustment provided to inlet duct. Kollsman type D-2 pitot-static head under starboard wing. 2.2 Engine limitations. The Allison V.1710 - F.4R has the same supercharger gear ratio (8.8 : 1) as F.3R, fitted to the Mustang I. The F.20R engine has the supercharger gear ratio increased from *.8 : 1 to 9.6 : 1. The air intake is arranged so that the cleaner element can be moved into or out of action by a cockpit control. Throughout the tests the cleaner element was out or action. Maximum for combat flight (5 min. limit) 3000 57" 3000 60"
2.4 Propeller. A Curtiss C.532D - F.32/50700 propeller, 10.75 geet dia. with 2 : 1 gear ratio fitted. 2.5 Loading. Tests were made at a take-off weight of 8,630 lb. with C.G. 2.16" aft of the datum. 3.1 With the F.20R engine level speeds were measured from 5000 to 20,000 feet with the radiator exit flap in the "faired" position. The climb performance, with radiator exit flap half open, was measured using the best climbing speeds as determined from partial climb tests. 3.2 Similar tests were made with the F.4R engine but the level speeds were measured over the height range 3000 to 18,000 ft.
3.3 The position error correction was measured on this aircraft by the aneroid method of the speed range 160 to 380 mph ASI with flaps and undercarriage up. 4.1 Reduction methods. The performance measurements have been corrected to ICAN standard atmospheric conditions, and the level speeds to 95% of the takepoff weight (i.e. 8200 lb.) by the methods of Report A. & A.E.E./Res/170. A "strut correction" has been applied for the Kollsman type underwing strut mounted pressure head, the source of this correction being the ARC paper 6420. The compressibility correction used is based on the methods given in Addendum to Report A. & A.E.E./Res/147. 4.2 Position error correction. 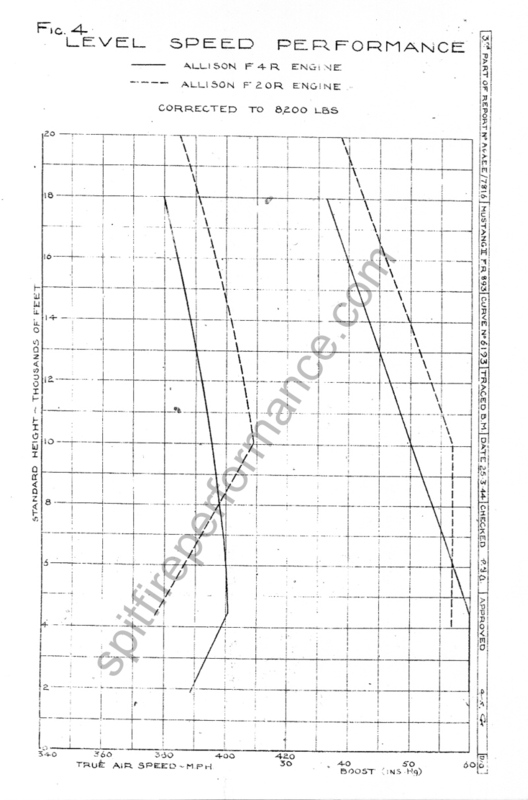 The position error correction is given in Fig.2 and the correction to altimeter in Fig.3. 4.4 Climbs. The climb test results are given fully in Tables III and IV and Fig. 5 are are summarised below. F.4R 4,090 ft/min. at 800 ft. 8.1 mins. 31,500 ft.
F.20R 3,800 ft/min. at 6000 ft. 6.9 mins. 34,000 ft.
6,000 385 375 -21.8 -1.5 +.3 " "
8,000 397 376 -21.9 -2.4 +.6 " "
10,000* 409 375 -21.8 -3.4 +.8 " "
Take-off weight - 8360 lbs. * Full throttle height Service ceiling 31,500 ft.
Service ceiling - 34,000 ft.